Our goal is to reduce unreported crime by giving users a template to use while they wait for the police to arrive. Eye witnesses to a crime tend to forget the events that occurred only minutes after they contact the police. This fact has stopped millions of criminals from getting charged. If the witness had documented their experiences, there would be a higher chance of justice. Witnesses also have a tendency to unconsciously change their statements or be influenced by others as time goes on. A user-friendly guided documentation will allow the witness to remember the details and have them ready for the police. 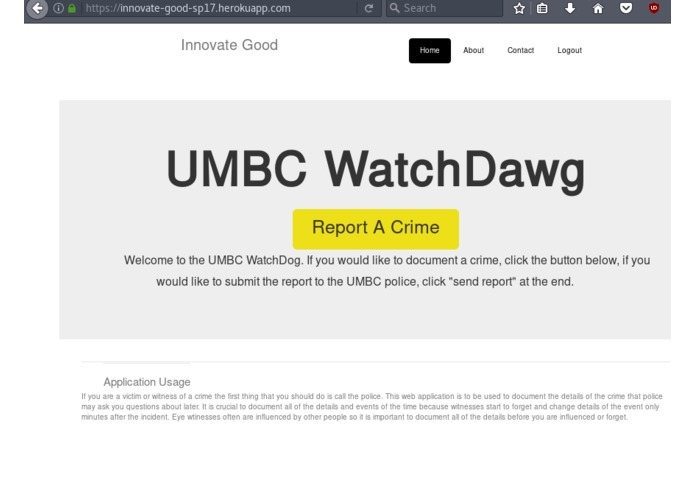 WatchDawg complies an eye witness report of a crime and has the option to send it directly to the UMBC police. The application asks users questions specific to the crime they experienced and guides them through what they need to record and remember. We used bootstrap templates for the front end and edited them with css and html. For the back end we used python, django, and OAuth2. We ran into a variety of problems, but were able to fix them independently without the help of mentors. All of the skills used for this project were self taught within the past 24 hours. Eventually we want WatchDawg to have the option to send the report to the police email. We also want to add the option for the application to generate a sketch of the criminal based on the information the user enters. We are also going to streamline things instead in order to create a better user experience. The questions asked will also become more specific to the crime. I worked on the backend and RESTful API and used the Django framework for Python with Heroku deployment for the first time. I worked on the front-end of the website development, designing all of the pages that the user will interact with.